Microsoft is continuing to make its apps more useful to iPhone and iPad users, with updates to the OneDrive app adding support for the Files app and iOS 11 features, while reports indicate the company is preparing to expand its Edge browser from iPhone to iPad in the near future. 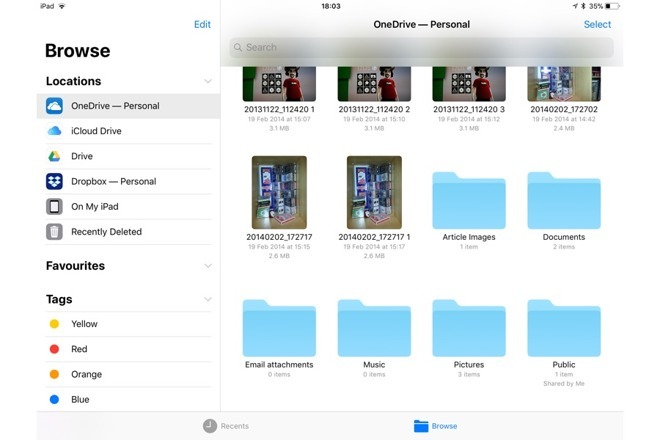 Microsoft has updated the OneDrive app to make its cloud storage service work more efficiently on iPhone and iPad, by adding support for features introduced in iOS 11, including the Files app. Version 10.1 of OneDrive now integrates with Files, allowing users to access content stored within OneDrive via the Apple-produced tool. Any file and folder can be opened within Files, regardless of whether it is stored on OneDrive or SharePoint, the update notes reveal, with individual files able to be tagged or labelled by users. Once opened in Files, the files can be updated and saved back to the OneDrive storage from within the Files app. OneDrive's support for the Files app follows similar integration added to the Google Drive app last year, with other services including Dropbox, Amazon Dire, iCloud Drive, and macOS X Server all supporting the tool since its launch. The app also adds support for other productivity features introduced in iOS 11, with Drag and Drop functionality allowing users to simply move files and incorporate items from their OneDrive storage within other apps by dragging it to where it is required. Dragging and dropping files between tabs is supported on both iPhone and iPad, with the latter also including support for drag and drop to other apps. Microsoft has also refreshed the appearance of OneDrive to be more efficient with space, using an "uncluttered text style" to make it easier to scan file names quickly. The UI now has clearer context menu items, larger thumbnails, modified the look of files and folders to make them easier to recognize, has larger and clearer command icons, and a new shared icon in the navigation bar to advise whom else has access to files and folders. The app also adds previews for over 130 file types, integration with Microsoft Flow, PDF annotation support for shared files, landscape support, and a number of other bug fixes. Microsoft OneDrive is free to download, needs 266.5 megabytes of storage to install, and runs on all iPhones, iPads, and iPod touch models running iOS 10.0 or later. A small amount of storage is available, but more can be acquired through the service itself, as well as via an Office 365 subscription. The Edge browser, originally produced for Windows 10, made its way to the iPhone last November, but it appears Microsoft is looking to take it to the bigger screen of the iPad. Neowin notes a post to Twitter by Sean Lyndersay, a program manager for Edge, advises that an iPad version is currently being worked on by the company. "The iPad version is in internal testing and looking great," writes Lyndersay, revealing it will be rolled out via TestFlight to some users in early February for feedback "before making it widely available." Details about when it will be available as a full release were not provided. Shh, don't tell anyone, but the iPad version is in internal testing and looking great. It'll take a little longer to bake, so we're going to roll out it to our TestFlight users early next month and get feedback from them before making it widely available. Thanks for using Edge! Like other browsers on iOS, the existing Edge release for iPhone uses the same rendering engine as Safari, but adds extra functionality that brings it closer to the Windows 10 version. 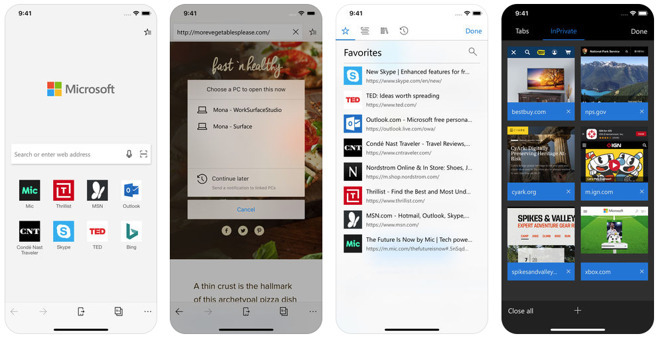 Edge on iOS offers content synchronization with the desktop counterpart, allowing browsing sessions to "continue on PC from the iPhone. The synchronization also includes saved passwords, favorite links and the user's reading list, with data kept identical across multiple devices. A central Hub View collects these and the user's history and books in one place, to make it easier to find and manage content. The browser also has an alternative dark theme, voice search, a QR code reader, and an "InPrivate" browsing mode.